Warning:These instructions presume pretty much no knowledge but some common sense, winky smiley. Firstly you have to decide how you want to hold your hook. There are a few ways, just do whatever you find easiest, obvs. How: approx 15cm from the end of the yarn make a loop with the ball end on top and hook down through the loop and catch the yarn, pulling it through. 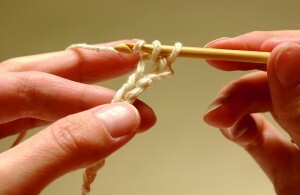 Pull both ends of the yarn to tighten the knot, but not too tight – you’ve been warned. You are now ready to crochet and it couldn’t be simpler. 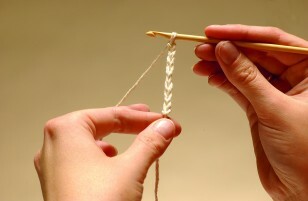 Do you remember when you were at school and you did metres of finger knitting? Well crochet is similar. 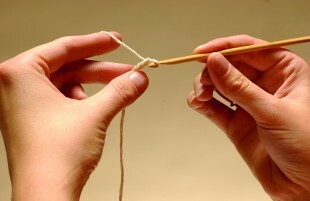 How: with the hook in your right hand, hold the slip knot between thumb and finger of the left hand. 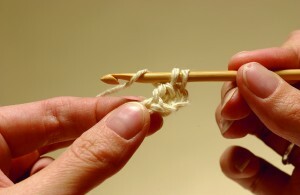 Move the hook under and over the yarn, with the yarn held in the hook. This action is called yrh or yoh. 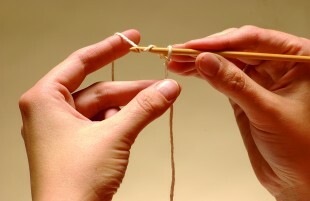 How: pull the hook and yarn back through the slip knot loop to form the first chain stitch. Ooooh so this is what your row of chains will look like. Keep going until you have the correct number of chains, as stated on your pattern. 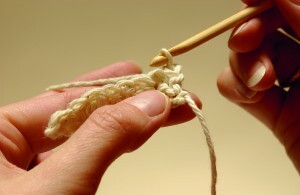 Make a slip stitch (sl st) which can also be known as single crochet and used to join a row into a round. How:insert the hook from front to back under the top of the second chain from the hook. Wrap the yarn round the hook (yrh). 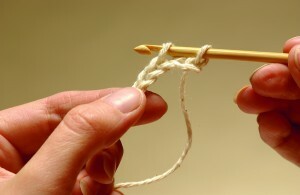 Pull the yarn through both of the loops on the hook to make a slip stitch. 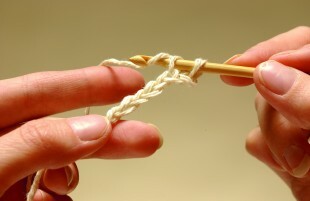 To carry on working a row of slip stitch, insert the hook into the next chain down and so on, repeating step 2 each time. Learn how to double crochet (dc) this is where things start to get interesting as your project grows! 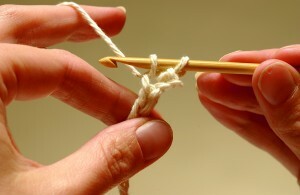 How: wind the yarn around the hook and pull it through the chain loop leaving two loops on your crochet hook. 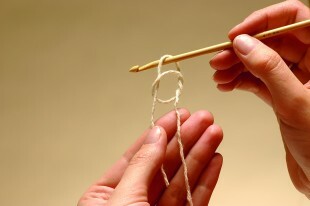 How:yrh again, then pull the yarn through both loops. There’s your double crochet (dc) made and you’ll have one loop left on your hook ready to do the next stitch. To do a row of dc, continue to end of chain sts. How: for the following rows you must turn your work and ch1. This is turning the chain (t-ch) and counts as the first dc. Skip the stitch, at the base then work 1dc under the top 2 loops of each stitch to the end, including the top of t-ch on following rows. 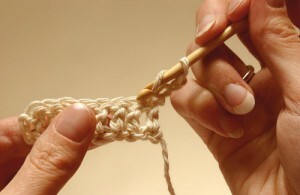 Learn how to treble crochet, it’s great for building. How:make a foundation chain. Skip 3ch, yrh, and insert hook under the top loop of the 4th ch yrh. How:pull the yarn through the ch loop only (3 loops on hook), yrh. How:pull the yarn through 2 loops only (2 loops on hook), yrh. Pull the yarn through these 2 loops. Yay! 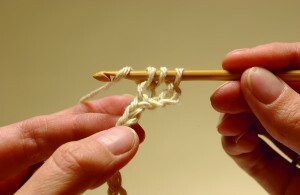 You’ve made a treble crochet. Continue working tr into next and all the following chains to end of the row. How: to make the next tr rows, turn work and 3 ch. This is the t-ch and counts as the first treble in a new row. 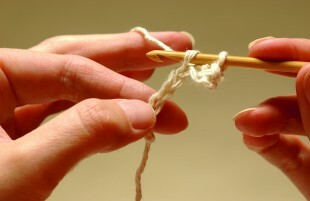 Skip the first stitch at the base, work 1tr into top 2 loops of 2nd stitch in previous row. Work 1 tr into next and each st to end, including into top of t-ch. Phew, all done. How did you get on? It might take you a few goes but practice practice practice and you will soon get the hang. 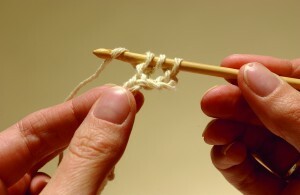 Once you have mastered the basics, the world of crochet is your lobster.